Pilfer and launder sentimental objects for a wealthy patron. Deliver the goods to the eccentric Thieves Guild patron. A wealthy patron of the Thieves Guild takes a peculiar pleasure in owning stolen goods. Her tastes are mercurial, but her payments are like Dwarven clockwork. Steal and launder the required items. Deliver the clean items to the client. "Esteemed thieves, I need your help. My wealth is vast and my wants are few. What I cherish most is that which I cannot simply buy. Well-lived objects, near and dear to their owners, from all walks of life. It is my last pleasure. Details attached." "Payment for stolen goods as requested will be rendered to the guild immediately, provided they have had all traces of ownership severed prior to delivery." "No partial deliveries will be accepted." You will need to find and steal three items of the types specified. If you have previously completed quests which offer laundered or stolen shipments, you might already have the items needed in your inventory. If not, collect them by following the hints in your quest log. Once you have the needed items and have laundered them, find the patron, Countess Viatrix Celata at the given location. After she has accepted the delivery, return to Kari in Thieves Den to collect your reward. Note that these only refer to the location where you must deliver the items. 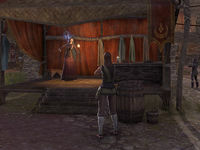 They can be stolen from anywhere, either via Pickpocketing, Murder, robbing Safeboxes, or looting other owned containers. The type of the stolen items can be seen right under their names when you hover over an item in your inventory, for example: Argonian Cologne. Note that the "Treasure Type" is listed as Cosmetics, Grooming items, meaning that this will work for either category. The value of the item makes no difference to the reward. If you reached your daily laundering limit on the respective character, you can also steal/launder the items on another character and then transfer it via the bank. The "Cosmetics, Linens, and Wardrobe Accessories" version of the quest also accepts "Dry Goods" in addition to the listed contraband types. For characters below level 50, the category is chosen by level rather than at random, depending on the level of the zone where the objects are handed in. So characters level 1-15 will always be asked for Games, Dolls, and Statues; 16-24 will always be tasked to steal Ritual Objects and Oddities, while characters level 25-30 will always be asked for Maps and Writings. The contract requests that I steal drinkware, utensils, and dishes, launder those items to remove all traces of the original owners, and deliver them to the client, but any clean goods should do. Now that I have the requested drinkware, utensils, and dishes, I must deliver the untraceable goods to the client in <city>. Finishes quest I completed the odd requests from that eccentric collector. Hopefully it was worth the bother. I should return to the Den for my cut of the payout.